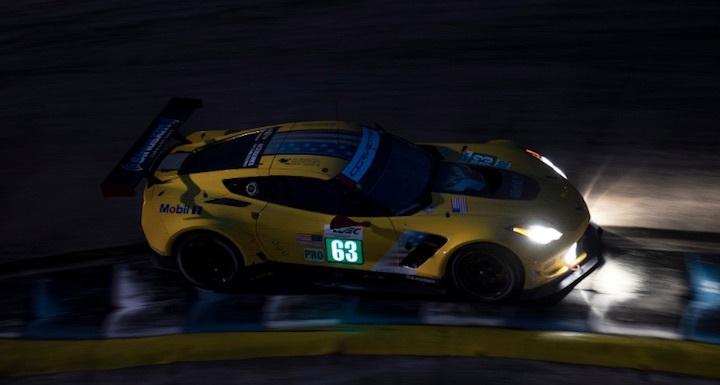 Corvette Racing struggled in the FIA WEC 1,000 Miles of Sebring, with the team’s sole No. 63 Corvette C7.R of Antonio Garcia, Jan Magnussen and Mike Rockenfeller finishing eighth in class. In a statement, the Chevy team said it “ran a solid race despite a couple minor setbacks,” in the pits that caused it to fall through the GTE Pro running order. The team started fifth in class and ran a race-high fourth, staying on the lead lap for the race’s entire duration, but didn’t have the pace to challenge the leaders. The GTE Pro class was won by the No. 91 Porsche 911 of Richard Lietz and Gianmaria Bruni, while the No. 81 BMW M8 of Martin Tomczyk, Nicky Catsuburg and Alexander Sims and the No. 67 Ford GT of Andy Priaulx, Harry Tincknell and Jonathan Bomarito completed the podium in second and third, respectively. Garcia found it hard to stay with the leaders due to minor issues in the pits and the race’s minimal caution flags, but feels as though Corvette Racing gained valuable WEC experience this weekend. Garcia said the race weekend was difficult, with Corvette Racing contesting both the WEC and IMSA rounds on Sebring, which were held on consecutive days. The team finished third and eighth in the IMSA race. Click here for full results from the FIA WEC 1,000 Miles of Sebring. They are racing a 6 year old race car wtf do you expect.